Imagine that you’ve finally embarked on the trip of your dreams… perhaps it’s an around-the-world plane ticket to all the 7 Wonders of the World, or a 6-month homestay in Cartagena to fine tune your Spanish. More than taking pictures, you’re hoping to find a truly immersive and meaningful experience. So you embark on your trip with an open mind, hoping chance will help you live your dreams. Everything is going great, and then a big decision point comes up that has you stressing out… Do you take the local farm-stay with a group of inspiring travelers that you just met, or do you go hike Machu Picchu so you can tick that Wonder of the World off your list? It might sound like a ridiculous thing to stress over, but the seasoned traveler knows that when you have limited time in a country, it’s common to stress out over the unexpected decisions you might have to make when choosing between destinations and/or activities. Time and time again I’ve seen travelers choose places over people and miss out on forming deep and meaningful relationships. “Things” experienced with others are always more memorable than by yourself. The truth is, travel is lonely—That’s why nearly every long-term traveler blogs and posts non-stop to social media. You might not have the luxury of traveling with your companion or best friend, but there are lots of ways to engage with locals and other travelers. There is no such thing as being lucky in travel, only being unlucky. Bad things will happen to you, but good things only come to those that put themselves out there. You won’t meet locals by going to tourist attractions, you won’t make friends staying in a single room at a fancy hotel, and you won’t find things “off the beaten” path by reading a guidebook. So how can you create your own serendipity? Luckily, people that engage in world-positive travel experiences tend to find more opportunities. This can be done by staying with local hosts, eating in homes or locally-ran restaurants, or through more intentional activities like volunteering their skills with locally-led organizations. Legally, I shouldn’t include this point. 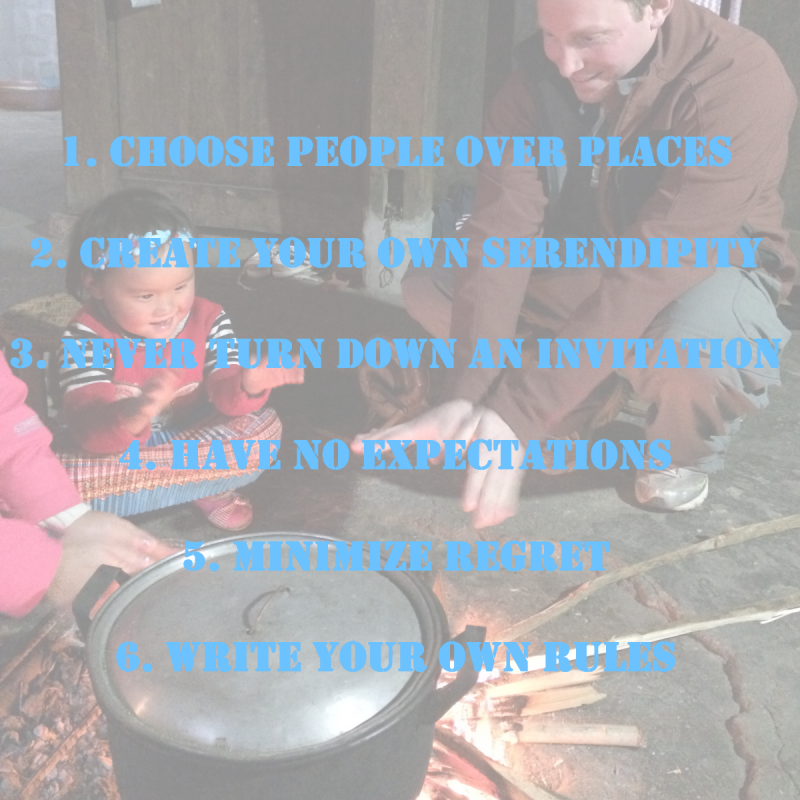 There are lots of things you shouldn’t do when you travel, but if you’ve built trust with someone and they invite you to something, I don’t care what your plans are, cancel them and accept the offer: See points #1 and #2. This might be as simple as canceling your afternoon plans to sit at a café and gossip, or it might mean changing your flight to go camping with locals. Research (and more research) shows this to be true. Jeff Bezos, CEO of Amazon, has a great video where he shares his Regret Minimization Framework – something I find to be very useful for travel, too. Sure, a picture of you standing in front of ___(insert famous icon here) will look good on your wall, but that unexpected side trip or that new friendship with someone from a different country will create long-term meaning… And sometime in the future, it will connect you to people and other unique experiences in ways that you can’t imagine. Cheesy as this might sound, people who write down their goals are more likely to accomplish them. The same goes for travel. Write down the type of travel experience you want to have so that, when faced with decisions, you will already know how to respond. Whether you use these, or come up with your own travel rules, put them on a small piece of paper, laminate them, and put them in your wallet. And my personal advice… Machu Picchu hasn’t gone anywhere for thousands of years, and it’s not going anywhere sometime soon. If it’s really that important, you’ll make it back. But that group of strangers you just met – that is a once-in-a-lifetime experience and you better seize it. Have your own travel rules? Let me know in the comments below!